This rural holiday home is a delight for the eyes. 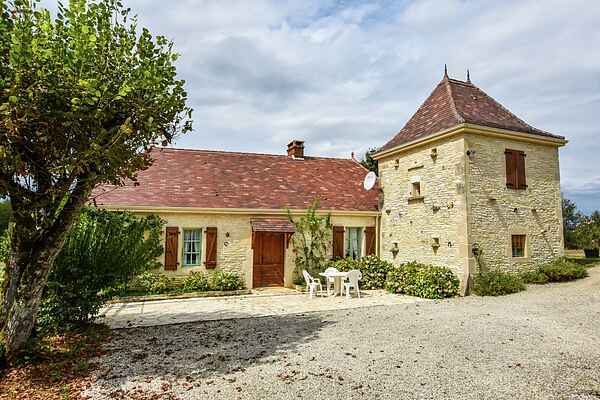 The house was very lovingly restored in 2005, paying a lot of attention to the dovecote, the typical tower. The 10 hectare land that surrounds the house offers you all the privacy you need. At the front, there is a large terrace with a view over the hilly landscape. You will have the use of garden furniture, loungers, a barbecue and shaded swimming pool. A bakery, grocery and tennis court are available in Thédirac. Go to Montgesty (3km) for your daily shopping. If you like culture, visit the small village of Les Arques (5km) with its pretty church and the Zadkine Museum. You will also find some good restaurants there. The town of Cahors (20km) in Lot and the fortified town of Gourdon (22km) with its bathing lake are worth a visit. You will find more lakes near Catus (7km). You will also be able to hire a canoe or pedalo there. For those who want to do a bit of cycling, you will find a bike hire shop in Villefranche-du-Périgord. You are on the edge of the Dordogne, so do not forget to visit Domme (26km) and La Roque-Gageac (29km), as well as the castles of Biron (49km), or even Bonaguil (Lot-et-Garonne, 35km). There is a swimming pool in Salviac (7km). There are golf courses in Belvès (28km) and Vitrac (29km).